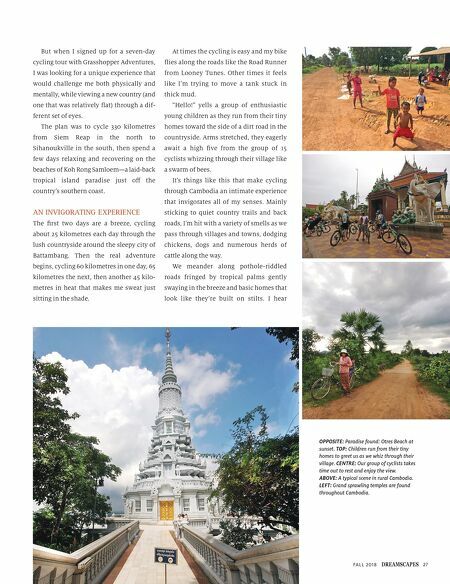 DREAMSCAPES FALL 2018 26 Cycling Through CAMBODIA "THE THINGS WE DO FOR FUN!" 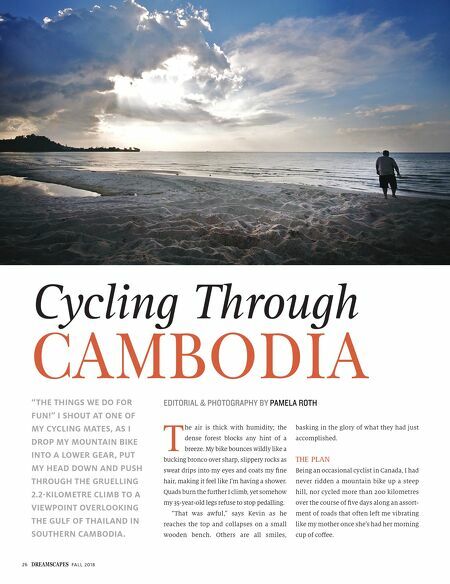 I SHOUT AT ONE OF MY CYCLING MATES, AS I DROP MY MOUNTAIN BIKE INTO A LOWER GEAR, PUT MY HEAD DOWN AND PUSH THROUGH THE GRUELLING 2.2-KILOMETRE CLIMB TO A VIEWPOINT OVERLOOKING THE GULF OF THAILAND IN SOUTHERN CAMBODIA. EDITORIAL & PHOTOGRAPHY BY PAMELA ROTH T he air is thick with humidity; the dense forest blocks any hint of a breeze. My bike bounces wildly like a bucking bronco over sharp, slippery rocks as sweat drips into my eyes and coats my fine hair, making it feel like I'm having a shower. Quads burn the further I climb, yet somehow my 35-year-old legs refuse to stop pedalling. "That was awful," says Kevin as he reaches the top and collapses on a small wooden bench. Others are all smiles, basking in the glory of what they had just accomplished. THE PLAN Being an occasional cyclist in Canada, I had never ridden a mountain bike up a steep hill, nor cycled more than 200 kilometres over the course of five days along an assort- ment of roads that often left me vibrating like my mother once she's had her morning cup of coffee.